Reinforced building houses sheriff's staff, emergency operations center; similar work continues on Public Services Building in Hillsboro. Washington County will have a more secure building for the sheriff's staff and its emergency operations center if a major earthquake hits. 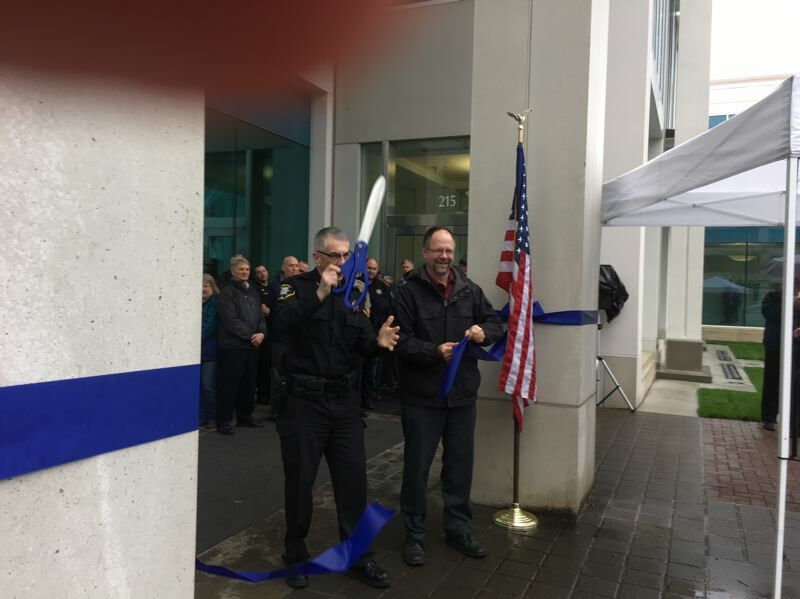 Officials took a few moments Tuesday, March 13, to recognize the completion of seismic upgrades to the Law Enforcement Center at 215 S.W. Adams Ave., Hillsboro. The center houses the Sheriff's Office — including the county emergency operations center — and the jail. "It will enable us to focus on public safety and community service when our community needs us the most," Sheriff Pat Garrett said. When originally completed in 1998, the Law Enforcement Center complied with existing building codes. 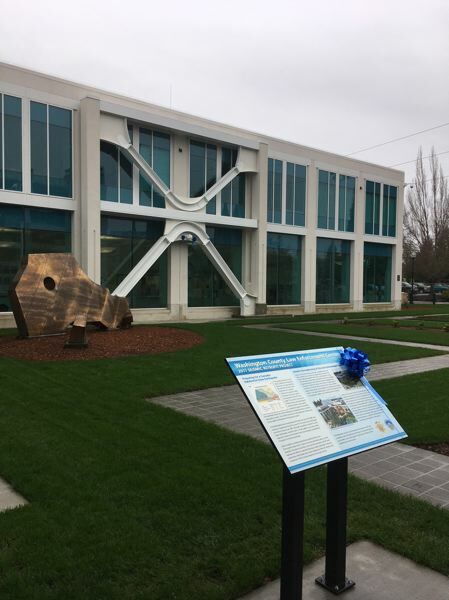 But more recent engineering studies concluded that the center could be damaged severely in an earthquake triggered by movement along the Cascadia subduction zone off the Oregon coast. The most recent such earthquake, with a magnitude of 9.0, occurred in 1700. Experts say there is a 40 percent likelihood that a similar quake could occur in 50 years. Exterior cross-braces at key locations were part of the seismic project, which was completed in mid-September. The work was largely confined to a portion of the Law Enforcement Center; experts concluded that the jail did not require additional work. "Some of us were displaced for a few months," Garrett said. "Others put up with a bit of noise. But we understood the noise was for a good purpose." The project was budgeted at $5.2 million. But County Administrator Bob Davis said the actual cost was $761,000 less — and it was finished two weeks ahead of schedule. "It's not easy to end up with a project of this magnitude on time and under budget," said Davis, who contrasted it with the extra spending required for the original Law Enforcement Center two decades ago. County spokeswoman Julie McCloud said the budget breakdown was $3.1 million from the county's Gain Share fund — state government payments that offset a portion of property tax losses from county breaks for investments of more than $100 million by qualifying businesses, such as Intel — plus $600,000 from the county general fund, and $1.5 million from Business Oregon. The latter agency oversees state grants drawn from a bond issue Oregon voters approved in 2002 to upgrade police and fire stations, hospitals and other buildings housing emergency services. Voters approved a separate bond for upgrades of school buildings. Others involved, all based in or with offices in Portland, were SERA Architects, JE Dunn Construction, KPFF Consulting Engineers, Professional Roof Consultants and DCW Cost Management. Meanwhile, work is continuing on another seismic upgrade, this one for the Charles D. Cameron Public Services Building at 155 N. First St., Hillsboro. The work has shut down the north wing, which houses the board of commissioners, county administrative staff, county counsel, and assessment and taxation. The commissioners have conducted most of their public meetings at the Hillsboro Civic Center since January 2017. County spokesman Philip Bransford said those offices may be able to reopen in the building later this year. Work has yet to be done on the south wing, which houses two major county departments: Health and Human Services, and Land Use and Transportation. Bransford said a series of announcements will inform the public about temporary locations for those and other offices. Unlike the Law Enforcement Center, the Public Services Building has had problems stemming from a high water table leaking into the basement. "it was a chronic problem almost from the beginning," Bransford said. As part of the seismic upgrade, the building excavation has been deepened — Bransford said the new basement will have windows — the basement will be waterproofed, and sump pumps will operate permanently to remove water. Like the Law Enforcement Center, the Public Services Building — named in honor of Washington County's administrator from 1986 to 2006 — complied with existing building codes when it was completed in 1990. The budget for that project is $29.2 million, $22.3 million of it for construction, and the county's Gain Share fund accounts for a major portion.